Image example Di Empire actor maintain say two pipo wey im no know na im attack am. Police don drop di case wey dem carry go di domot of American actor Jussie Smollett say im lie, fake racist and homophobic attack against imsef. Di Empire star bin show for court on Tuesday and na dia di judge throway di case for dustbin. Smollett bin tell police for January 29 say two men attack am for Illinois city, im say dem shout racist and homophopic curse for im head before dem pour bleach for im body come put rope round im neck. 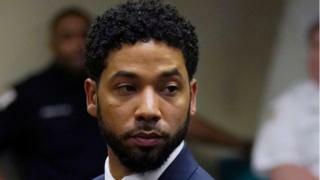 Kasala burst wen Chicago police comot say Smollett, 36, pay two brothers, both of dem black, $3,500 to stage di attack because e no "satisfy" wit im salary" ontop im TV show. Im lawyers on Tuesday maintain say true-true e no know di pipo wey attack am. Cook County state lawyer office tok for statement on Tuesday say: "Afta dem chook inside di whole mata, including how Mr Smollet do volunteer work for di community and also agree to forfeit im bond money to di City of Chicago, dem believe say di outcome na just di correct wey to end di case"
For statement, im lawyers, Tina Glandian and Patricia Brown Holmes tok say sem don wipe Smollett record clean now. Meanwhile as all dis one bin dey happun, dem don comot di actor from di Empire season finale last two episodes.